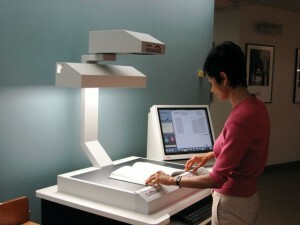 Scanning and copying large format materials is now possible at the Van Wylen Library using the new Indus book scanner. The book scanner is different from other scanners and copiers because it scans with the book face up. Books don’t need to be flipped over to turn to the next page. This means that you can copy over twice as fast as a traditional copy machine. With a 17 x 24 inch scan area, you can copy or scan larger materials. There are several other advantages to using the book scanner. It helps to preserve fragile library materials such as bound journals from the late 19th and early 20th century. Images can be saved to a USB drive or burned onto a CD and later incorporated into reports or presentations. Materials normally too large to scan or photocopy, such as artwork and maps, can now be preserved digitally. The scan software allows users to manipulate the scanned area and therefore create cleaner images and adjust for the curve of thick books. While images can be printed in either black and white or color, we hope that library users will save paper by scanning images to a digital storage device. The book scanner complements last year’s installation of multi-function printers (MFPs) by giving users another option, particularly for large format materials. The book scanner is located on the 2nd floor of Van Wylen Library. It is publicly accessible and instructions are posted near the scanner. Users however may want to ask for a quick orientation before using it for the first time.